In its layout, aesthetic and on-site services, the new housing complex planned for 16th and Folsom streets will be geared emphatically toward housing families. Up until 2008, the site operated as the shipping warehouse for a large-scale bakery. Representatives for the developers, the Mission Economic Development Agency and Tenderloin Neighborhood Development Corporation, as well as the architect and landscaper, told a group of neighbors Wednesday night that their plan for the space includes a daycare center, a high concentration of multi-bedroom units, and small, awning-covered windows meant to emphasize that the new building will be primarily living space. The proposal is for a 143-unit, eight-story building with housing on top of commercial space. More than half of the housing units will be two or more bedrooms, meant to accommodate families. On the ground floor, 5,000 square feet of space will be dedicated to a daycare center for children up to five years old, which will also have an attached outdoor play area. Gardens are planned for upstairs mezzanines as well as the roof, and almost the entire roof is covered either by green space or by solar panels. The estimated rents are meant to be affordable to low-income families, with a two-bedroom unit expected to rent for about $1,560 and a three-bedroom expected to cost about $1,730 a month. The housing is meant to be affordable to families making up to 60 percent of the Area Median Income. San Francisco’s median income for a family of three is currently $103,750 a year. A large portion of the ground floor space is reserved for production, distribution, and repair (PDR) use – essentially light industrial and arts space. For affordable housing advocates, the plan is a victory. The proposal is contingent on the city approving a Special Use District for the parcel on which the building is proposed, because current zoning doesn’t allow for housing. It would also allow the building to rise above current height limits to maximize the number of units. Given that the city granted the developers some of the funding for the lot acquisition, it’s likely the proposal will be approved. Nonetheless, it also has its critics. Doug MacNeil, a bookbinder and property owner just a few blocks down 16th Street, was frustrated by what he saw as an about-face from the Mission Economic Development Agency. He said 20 years ago, the nonprofit advocated strongly for the site to remain PDR to retain light industrial jobs in the area. Its zoning, he said, should not be changed. The delivery warehouse has been vacant since it shuttered in 2008. Keeping the zoning in place, MacNeil argued, kept the development potential minimized and the property value low, which also made it convenient for the nonprofit to come in, buy up the lot, and propose housing with special permission. Feliciano Vera, the agency’s senior project manager, said that while he was not a member of the organization at that time, that was also long before the nonprofit was even concerned with affordable housing. The organization’s community real estate division was established in 2014. MacNeil argued that changing the zoning leaves out low-paying jobs. He would have liked to see an industrial practice like a printing press, a large scale laundry, or an auto body shop. Street space, too, was a concern. MacNeil argued that the project does not add any parking. While changes to the street space along the proposed building would mean that the number of on-street parking spaces are the same, the building itself has 164 bike racks, but no parking. “It’s the biggest problem besides homelessness. This project provides no parking, so it’s going to move the second biggest problem to the primary problem,” he said. Rick Hall, another neighbor who is a frequent presence at planning commission hearings praised the architecture – done Leddy Maytum Stacy Architects – for its modest and scaled-back appearance but raised a concern about delivery. One side of the building’s commercial space includes a loading dock, but the other side faces a bus bulb-out – not conducive, he said, to the kinds of deliveries a light industrial business on the ground floor might require. Another concern raised is a familiar one to the two developers, because it resulted in significant delay for another project just a block away. Flooding, said one neighbor, could be exacerbated by the construction of new residential housing on the block. The area around 17th and Folsom streets is notorious for flooding during heavy rainfall because it lies in a topographical low point and the confluence of all the city’s rainwater overwhelms the sewer system there. 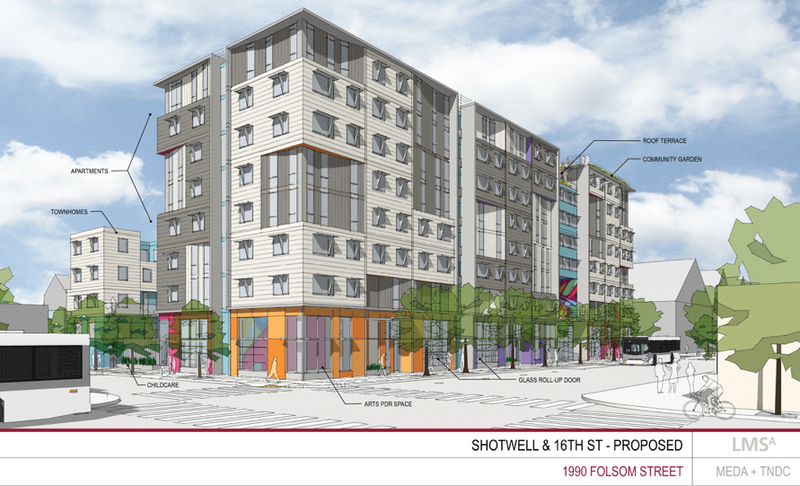 Margaret Eve-Lynne Miyasaki, a paralegal who lives nearby, filed a discretionary review request for the Development Agency’s other project at 17th and Folsom streets. The project was later approved by the Planning Commission. Miyasaki attended Wednesday’s meeting and said she had similar concerns about the 16th and Folsom project. For his part, Vera said the building includes permeable surfaces for rainwater mitigation. The Public Utilities Commission has stated previously that adding a new housing development in the area would be unlikely to affect the neighborhood. Serious repairs to the sewer system are still several years out. Miyasaki also said that Vera had agreed to meet with her and hear her concerns. Meanwhile, the nonprofits will submit their application to the Planning department, and hope to begin construction in 2019, with residents moving in as early as late 2020. PreviousHow many men does it take to steal a cell phone? Why do they have to make these new developments so ugly? Why can’t they make them look like San Francisco? It’s the city’s race to mediocrity. What would you consider to look like San Francisco?